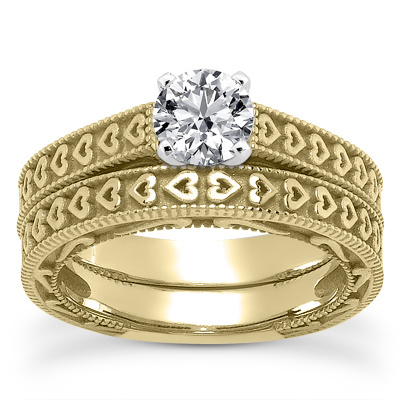 The sweet and feminine motif that adorns both pieces in this 3/4 carat engraved heart engagement ring set in 14K yellow gold creates a clear picture of affection. A repeating heart motif is carved into these rings, and it's bordered by petite milgrain edges as it points the way toward a dazzling centerpiece. A + carat round diamond rises from the engagement ring in a four-prong setting, giving this 14K yellow gold bridal ring set an abundant measure of sparkle. A 0.75 carat diamond is set in an engraved heart bridal ring set in 14K yellow gold. Also available in 14K Rose Gold, 14K white Gold or Platinum and 1 Carat by request. Apples of Gold Jewelry guarantees the 3/4 Carat Engraved Heart Engagement Ring Set in 14K Yellow Gold to be of high quality and an authentic engagement ring with real diamonds, as described above.